When we moved from London to Phoenix, it was a breath of fresh air. We could actually enjoy life a little more and not worry about not havi money to pay for food and/or day care. Although we enjoyed our lives in London, yes, we did enjoy it a lot, salaries are way lower than in the US and many times we had to really tighten our belts to stay afloat. 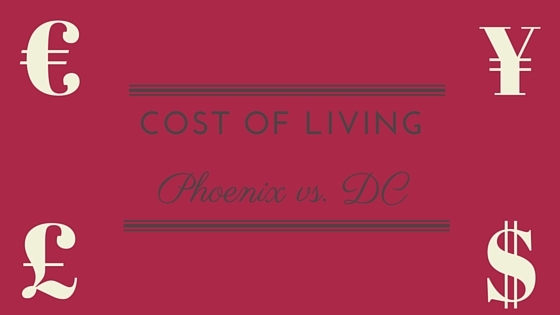 Cost of living in Phoenix is much lower than London and the other side of the coin, is that cost of living in DC is much higher than Phoenix. We almost had a heart attack when we had to go food shopping for the first time and get all the pantry staples, fill the fridge, etc. Crazy! And that's not all, every time I go to the grocery store for a quick trip is always more than I expect it to be. But the good thing is, in the US, salaries follow the cost of living (pretty much), unlike England, where the salary really doesn't support the cost of living. So, if you move to a more expensive city (I'm assuming, you'd move with a job already), your salary would increase as well. Expatisan is great because they have people adding the items and prices locally, which means the list gets constantly updated. Their blog is outdated and their international school database that I wanted to use is not ready, but the cost of living comparison is really great. Please note: This is NOT a sponsored post. I found this site and thought it would be useful to share.